As regular readers are well aware, when it comes to "more than arms length" equity market intervention in New Normal markets, the New York Fed's preferred "intermediary" of choice to, how should one say, boost investor sentiment aka "protect from a plunge", is none other than Chicago HFT powerhouse, Citadel. Yet one question had remained unanswered: just how does Citadel manipulated stocks? We now know the answer, and perhaps more importantly, it also links in to the true culprit behind the May 2010 Flash Crash, no not Waddell & Reed, but quote stuffing. Most importantly, the revelation that for Citadel quote stuffing is not just some byproduct of some "innocuous" HFT strategy, is that none other than the Nasdaq has now stated on the record, that the most leveraged hedge fund (at 9x regulatory to net assets), and the third largest after Bridgewater and Millennium, used quote stuffing as a "trading strategy." One wonders: did Citadel (with or without the Fed's urging) also have something to do with the infamous and biggest (to date) May 2010 market crash and subsequent surge - and was it merely a test for something else? The paragraph states that Citadel was sending excessive orders (Quote Stuffing) as a trading strategy 3 separate times. This was not a glitch or human error, it was an intentionally programmed trading strategy! If there was a glitch, it would be from from a human mis-configuring a parameter, allowing the Quote Stuffing trading strategy to blast orders at rates much higher than 200 per second. Is placing and cancelling 200 orders per second excessive? This depends on whether they are spread out evenly over the entire second (1 every 5 milliseconds), or if all 200 are sent in one 5 millisecond burst and then silence for the remaining 995 milliseconds. If sent in a burst, the impact on networks and trading systems is significantly higher than if spread out evenly (see Latency on Demand and Direct Feed Slowdown). Furthermore, a burst followed by quiet wouldn't be detected by exchange monitoring software looking at traffic at one second resolution or higher (most internet monitoring software looks at 5 minute averages!). This isn't theoretical, it's real and we have documented many examples, such as this one here. After analyzing Nasdaq's TotalView data (their direct feed) and SIP data, we found a few inconsistencies with Nasdaq's finding. 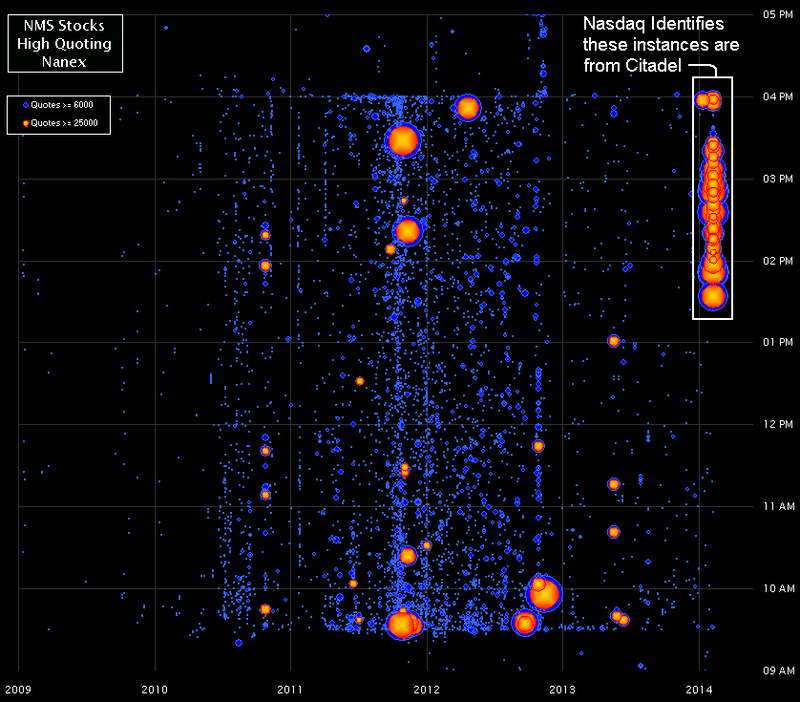 First, Nasdaq claimed Citadel placed these orders at a rate of 8 to 9 per microsecond (millionths of a second). That is wrong, they probably meant per millisecond (thousandths of a second) - you'd think an exchange that catered to HFT would know the difference. The data shows the Citadel Quote Stuffing algo placing and canceling orders at a steady rate of about 17 messages per millisecond, or half that number if we are counting orders: so 8 to 9 orders per millisecond (1 message to add the order, and 1 message to cancel it). Only one order was active in Nasdaq's order book at any given time - it would place an order, then cancel it, before placing a new one and repeating the process. The other inconsistency is that Nasdaq states Citadel's Quote Stuffing algorithm ran in PENN between 13:32:53.029 and 13:33:00.998, but both direct feed and SIP data shows it ran between 13:32:48.875 and 13:33:04.525. This is clear in the chart below: the red is TotalView activity, the blue is the SIP (which is stacked on top, not behind). Let's zoom in on one second of time and look at data from both TotalView (Nasdaq's direct feed) and the SIP, when Citadel's Quote Stuffing strategy was running in Penn National Gaming Inc. (symbol PENN). Each pixel along the x-axis is 1 millisecond (1/1000th) of time. 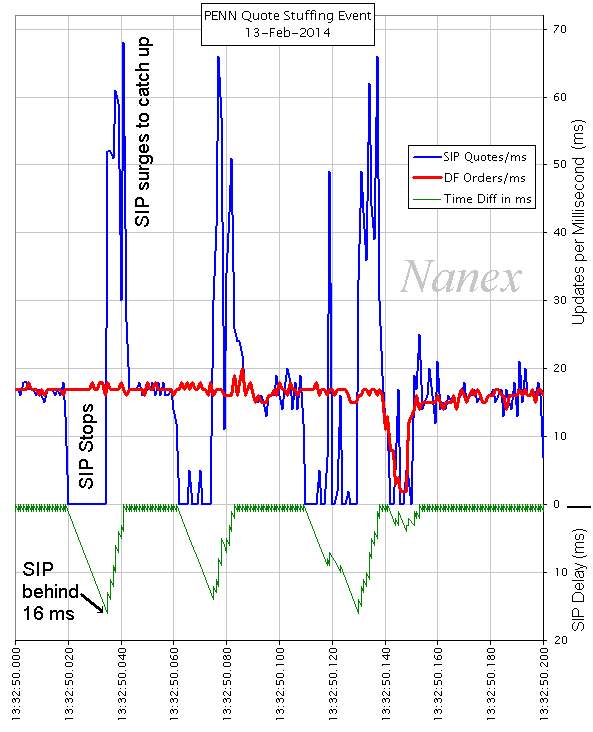 The blue line shows the number of quotes sent by the SIP during each millisecond. The red line shows the number of order messages recorded in TotalView (DF, the direct feed) each millisecond. Lastly, the green line shows the lag between the SIP and the TotalView. According to Reg NMS, there shouldn't be any lags: but there are many. You should know that the lag to the SIP isn't confined to PENN - all other stocks process by the same network/computer will experience the same lag. What is the benefit of a lag? For one, latency arbitrage is enhanced, especially if the lag is predictable, which it would be for someone running a Quote Stuffing trading strategy. The type of firm that would benefit the most from latency arbitrage would be an internalizer - someone that matched retail stock trades based on the slower SIP, but could buy and sell the same stocks on the faster direct feed. By the way, Citadel's bread and butter is internalizing (matching) retail stock trades. Another benefit is that lags throw off smart order routers, and that can enhance HFT's ability to pick off stale dark pool orders (many of which are priced on the SIP), as well as allow them to get out of the way of a large order (see this example of a trade we documented in detail). 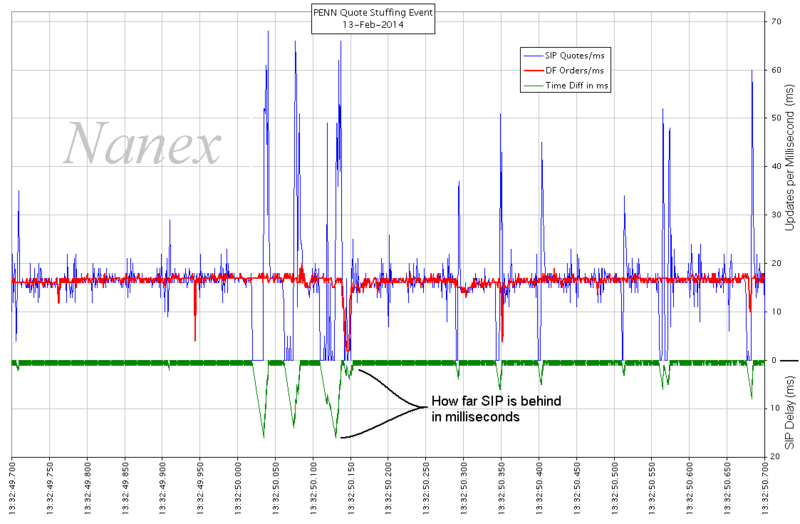 Direct feeds can also be slowed down: see this detailed examination of delays in NYSE's OpenBook caused by Quote Stuffing. How often do Quote Stuffing trading strategies run in the market? All the time! Many seconds of the trading day will have multiple symbols with Quote Stuffing events, but these algos usually stuff quotes at rates of 200 to 1000 per second per stock. The chart below shows all instances of high quote spamming events (more than 6,000 quotes in 1 stock in 1 second) for all NMS stocks between 2009 and when the Quote Stuffing algos were detected (February 2014). The dots are sized to the number of quotes in an event second. The red color indicates when the number of quotes exceeded 25,000 in 1 second. The events that triggered the Citadel fine are in the labelled box. Note that the threshold for inclusion on this chart is extremely high. A rate of 6,000 orders placed and cancelled per second means that each quote has a life shorter than 1.6 millionths of a second - the amount of time it takes for light to travel about 1,500 feet. Anyone farther than half that distance has no chance of executing against these quotes. Citadel is the first and only firm that was fined for running a Quote Stuffing trading strategy.